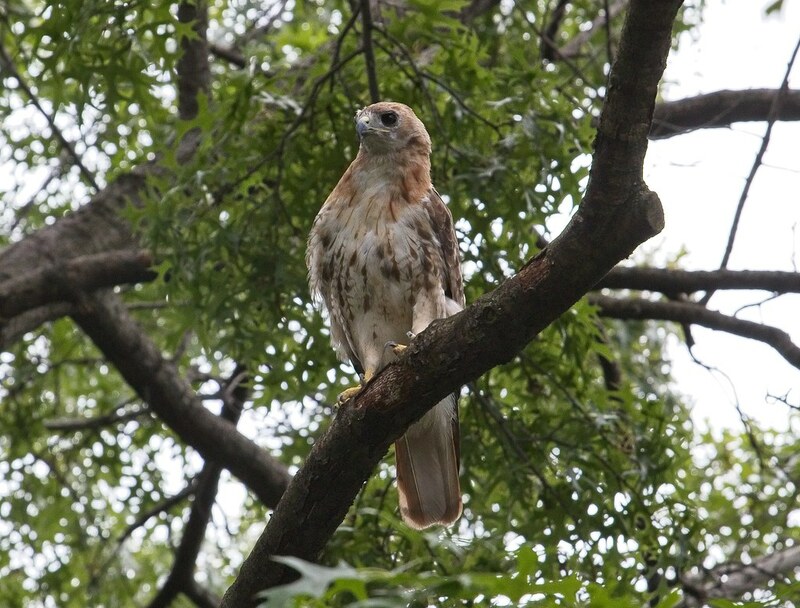 It's the time of year when I grow a bit sad as I know we'll be bidding farewell to our young hawks soon. 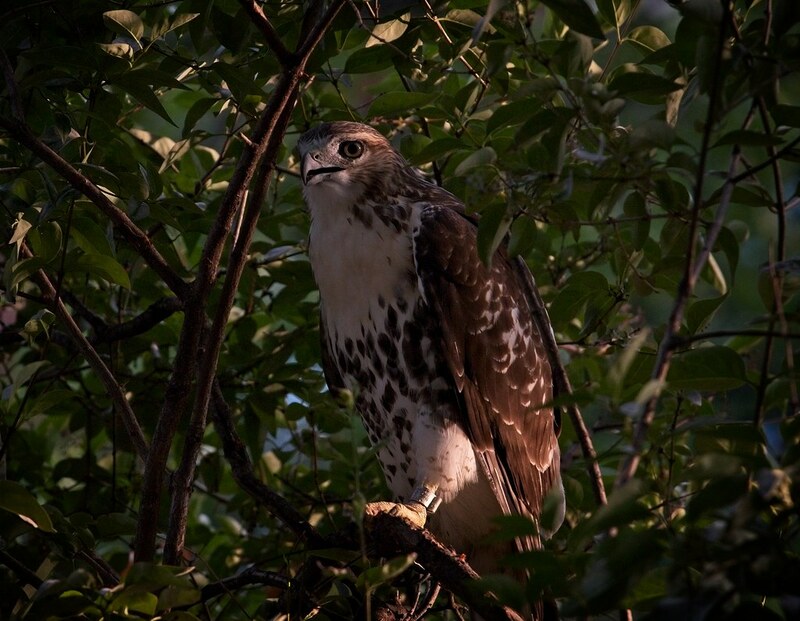 In 2016, one of the three hawks born in Tompkins Square stuck around until late August. In 2015, my last sighting of Christo and Dora's kids happened the first week of August. 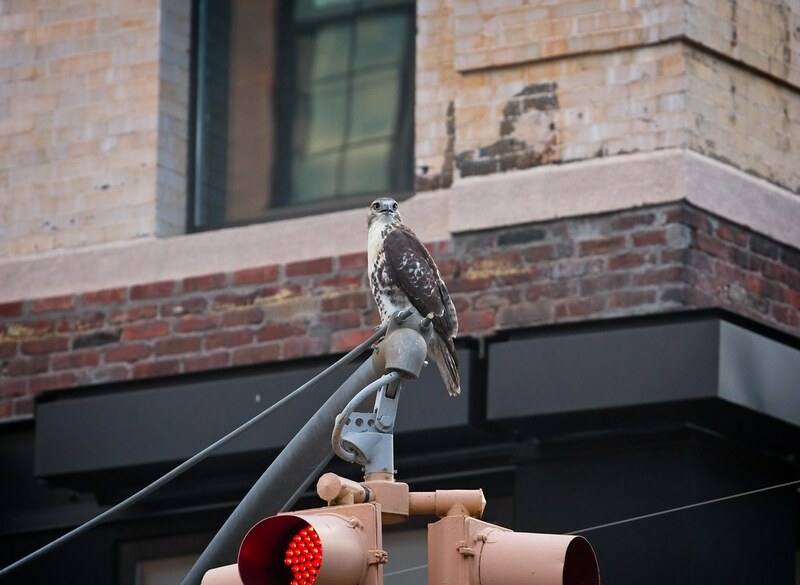 That year, the nest was on the Ageloff building on Avenue A, and the fledglings never spent much time in the park. 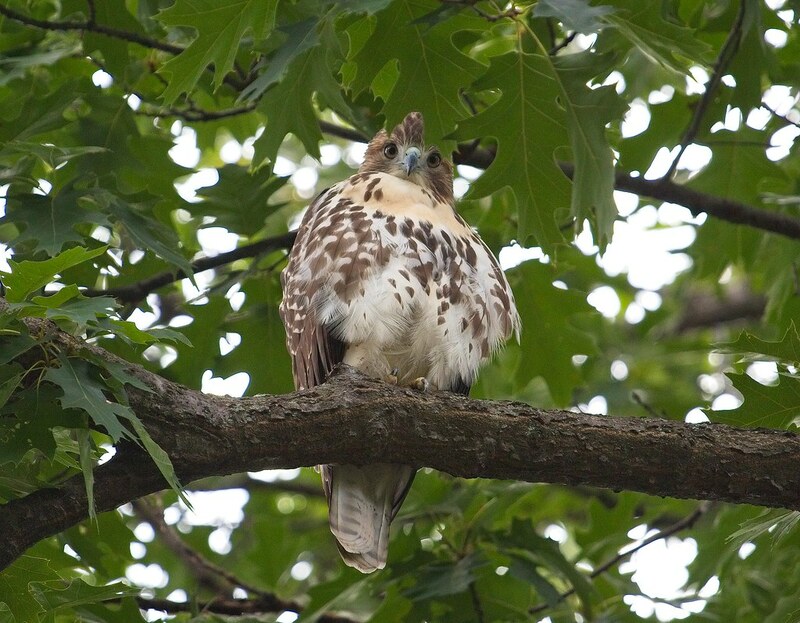 In 2014, when the hawks nested on the Christodora, my last sighting of the older fledglings was August 1, and the youngest sibling that year, who stayed in the nest six days longer than the others, took off in early September. 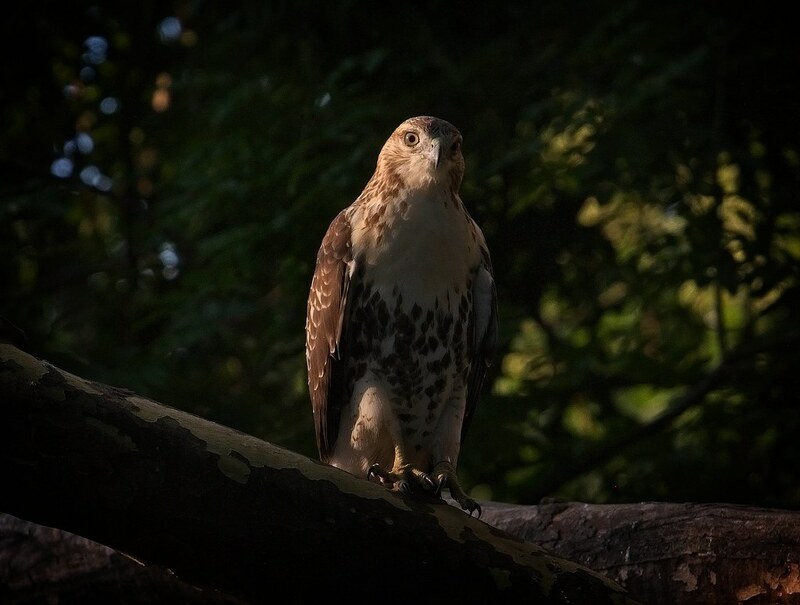 This year has been different as we have Ten, who was born in the park, and Flatbush, who was a rescue and took some time adjusting to his new surroundings. He's turned out to be the big explorer and I've had more difficulty finding him lately. 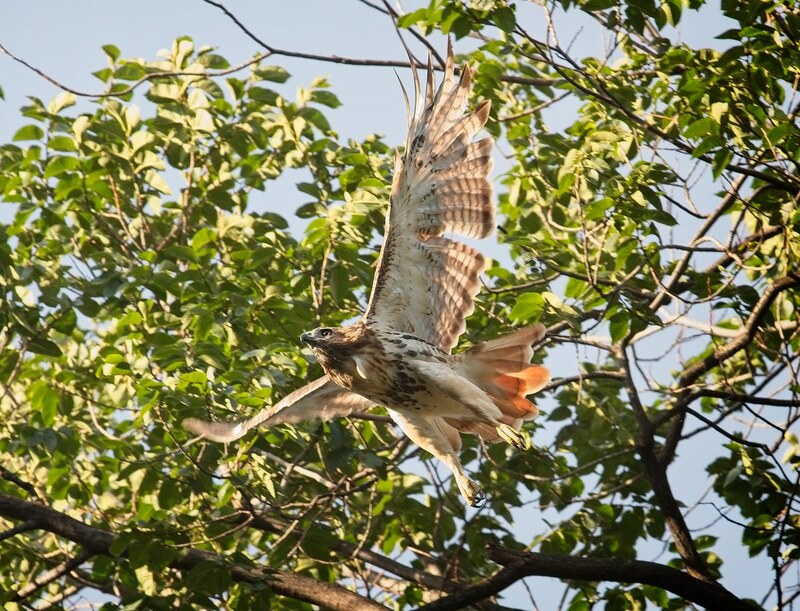 On August 3, however, Flatbush made his presence known in a dramatic way by zooming all over the park and along Avenue A. 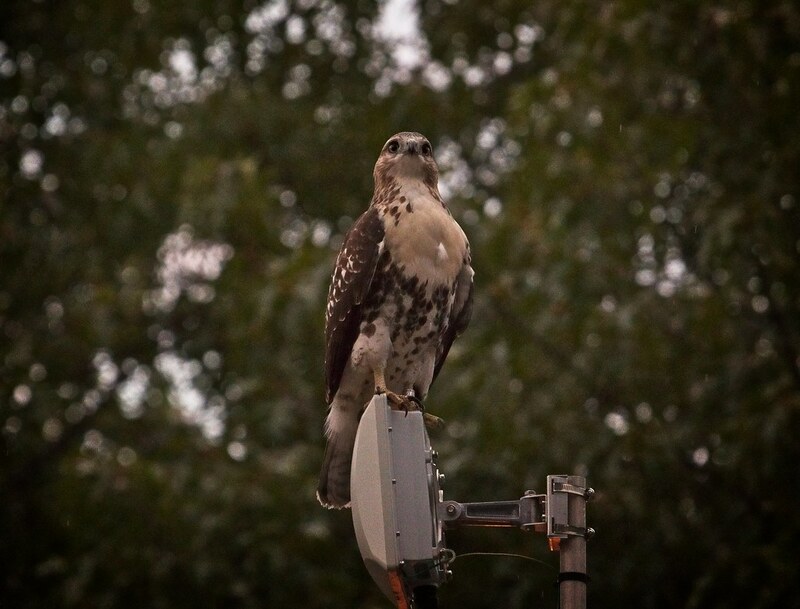 He made my heart stop when he took off from a fence inside the park and flew low over traffic before taking center stage on a traffic light at the intersection of Avenue A and 7th Street. He is easily identifiable by his leg band. 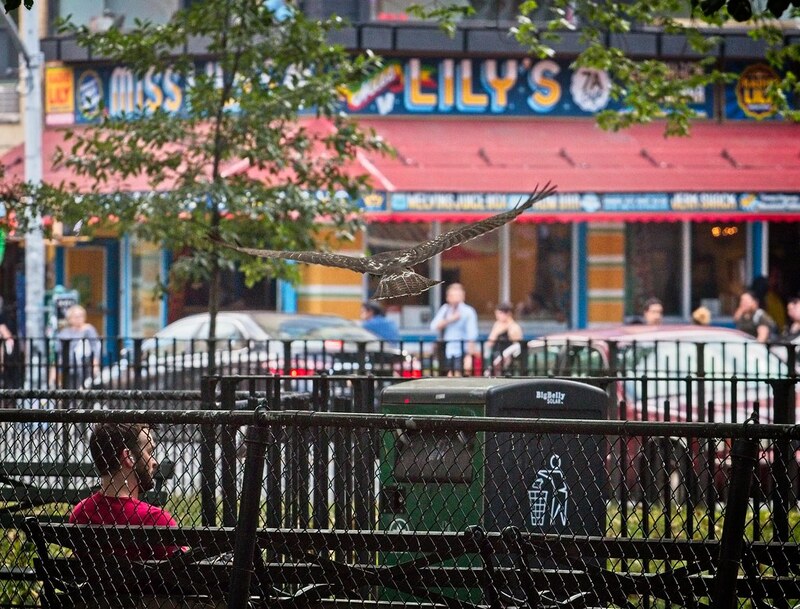 Although Flatbush's antics were entertaining, I felt much better when he returned to the safety of the park. 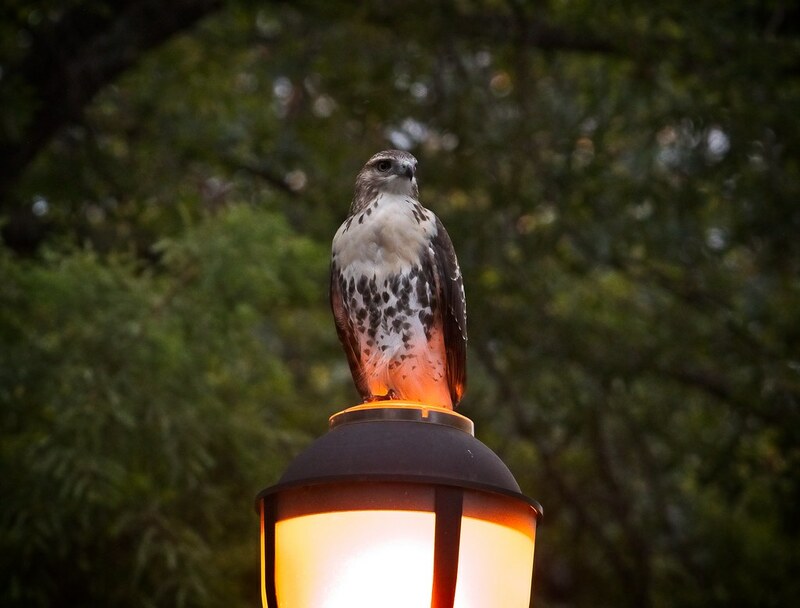 Flatbush has picked up a few tricks from foster-dad Christo, like perching on the illuminated lamp posts after the sun goes down. 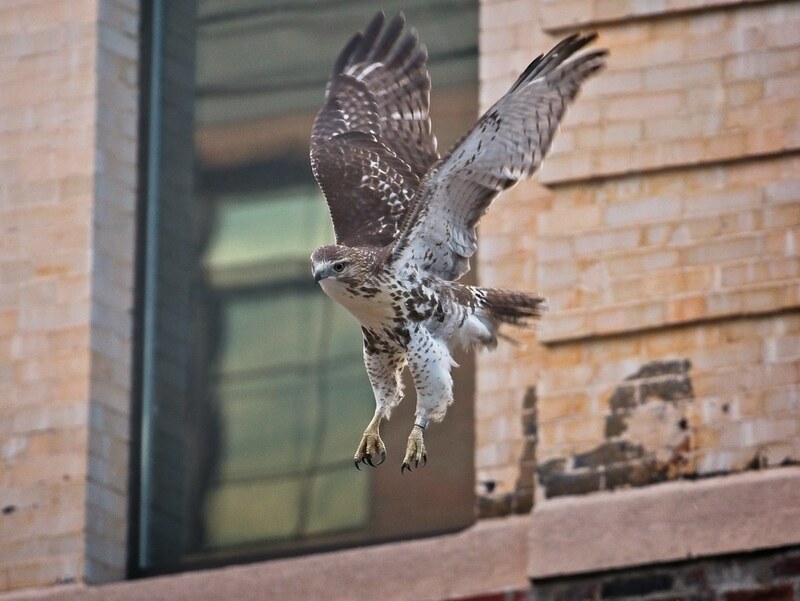 Christo often hunts for rats this way, so maybe Flatbush will learn to do the same. And, as Christo is known to perch on the cellphone antenna atop the park offices, so does Flatbush. 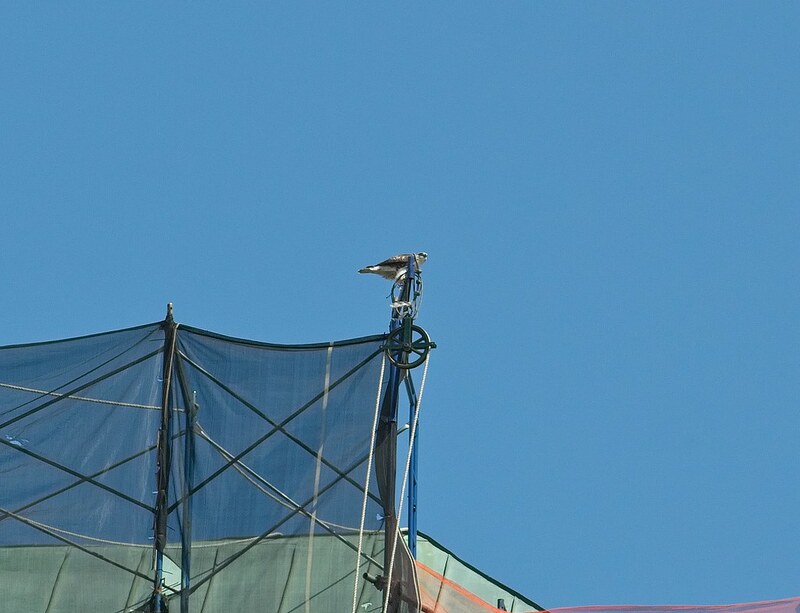 On August 5, after seeing Christo perched on top of the scaffolding at the Christodora, Flatbush came along and took his place. This, and the Village View high-rise at 1st Avenue and 4th Street, are the highest points at which I've seen him. 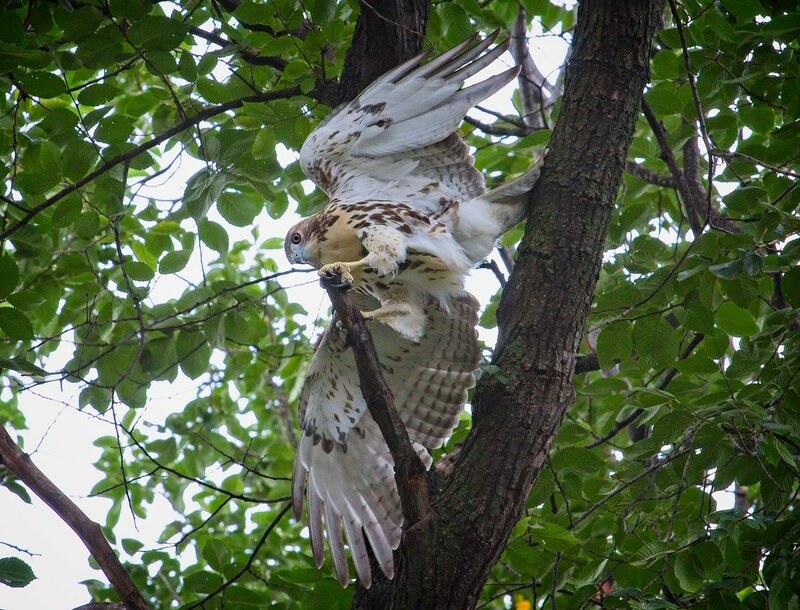 While Flatbush was up on the Christodora, Ten was perched in a tree near the Temperance Fountain. A month ago, Ten seemed to be advancing quickly and I thought she'd be off on her own by now. But, for what ever reason, she has been staying close to home. 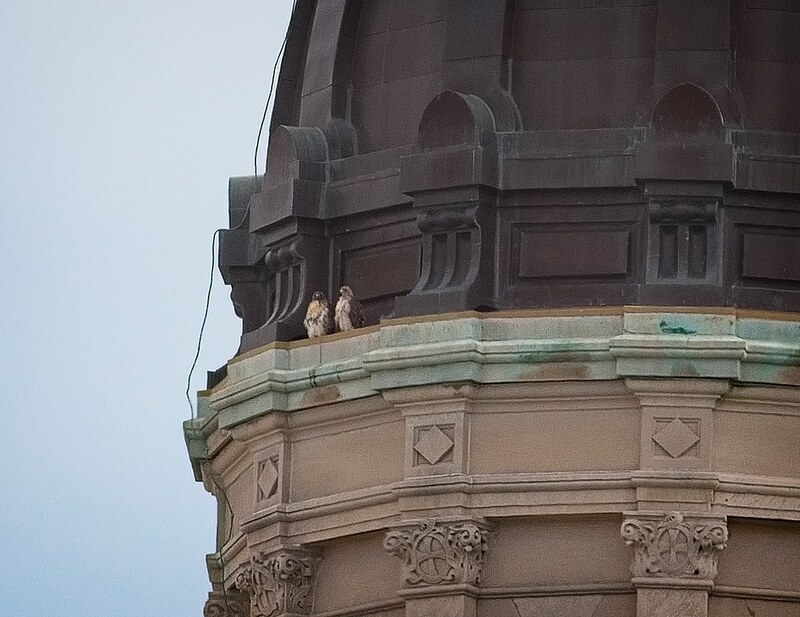 Christo and Dora are currently molting and both hawks look pretty ragged. 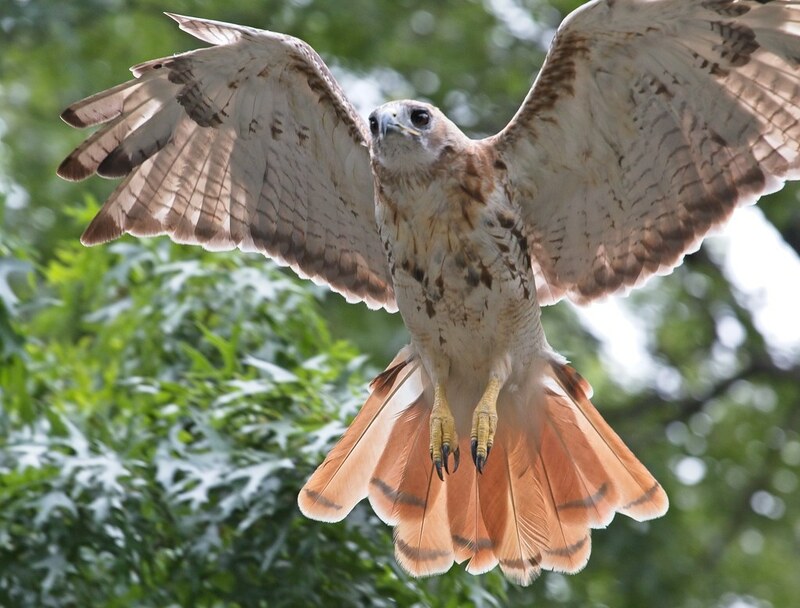 Below, you can see Dora is growing new tail feathers and she has some gaps in her wings. Christo resembles a ghostly old man. I always feel bad for him when he looks this way, but he's fine. This last weekend saw two punk concerts in the park. 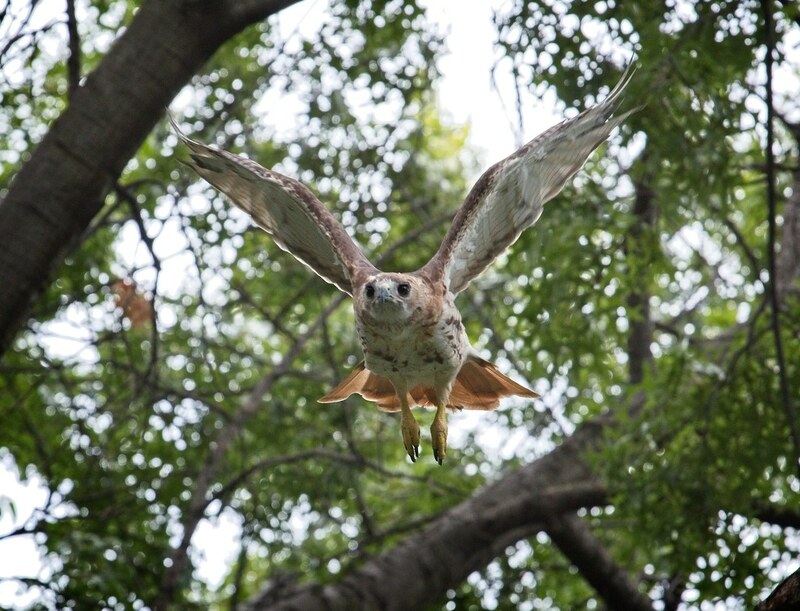 People often ask me of the loud music scares the hawks away. Nope! In fact, it's a theory of mine that they actually like it. Over the last four years, Christo and his kids often attend the punk shows. My favorite sighting was seeing Christo take in a performance by the Voluptuous Horror of Karen Black (see the last paragraph of this post for details). This last Sunday, Flatbush was spotted in the tree above the stage while The Nihilistics played.